By John C. Toman and Jim Purpura. Posted April 12, 2012, 3:54 PM. As part of Tuesday's storm, a funnel cloud, later classified a "gustnado", was reported in Southeast Hemet by a National Weather Service spotter. WeatherCurrents' Jim Purpura, at the request of NWS' San Diego office, surveyed the area where wind damage was reported. The funnel cloud touched down during yesterday's rains at the Santa Rosa Mobile Home Park on South State Street, near Diamond Valley Middle School. Strong winds tore off a portion of a carport attached to a mobile home. Eyewitnesses saw the debris lofted into the air and deposited to the southeast, on the property of the middle school. Purpura classified the event as a weak tornado, or "gustnado", based on significant damage at the site. This storm had estimated wind up to to 65 mph. "The tornado likely formed from the low levels near the ground, or developed down from a circulation higher in the storm," said Purpura. 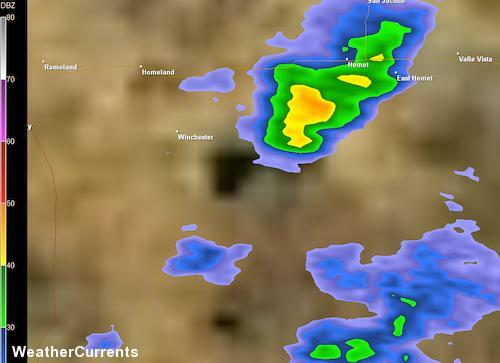 NWS radar, taken at 1:20 pm yesterday in the Hemet area (see below), shows a hook shaped area of the storm in yellow. This may be interpreted by meteorologists as a storm with circulation or a broad rotation above the ground, and can be associated with storms that produce severe weather. Following Purpura's recommendation, the National Weather Service affirmed the event as a gustnado on Thursday. Radar echo hooks have been characteristic of other tornadoes that have occurred in recent years in Riverside County, including the Perris/Moreno Valley tornado of 2007, the strongest reported in Southern California, and another in Fallbrook, Rainbow and Temecula in 2005. The location of the event was about four miles west of WeatherCurrents' Hemet weather station. Jim Purpura's meteorology career included a long stint in tornado-prone Oklahoma. Radar image from 1:20pm, Tuesday, April 11th. Note the echo hook. 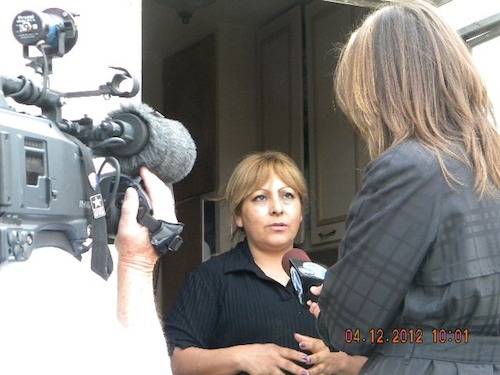 A TV news crew interview a woman at the affected mobile home.